In principle, this is a valid point, yet the seven years that separate those two articles—and the wealth of new genetic data, as well as advances in genetic testing and computational processing of data that occurred in that period—make me more willing to place my bets on the side of Longobardi et al. rather than earlier article by Novembre et al. 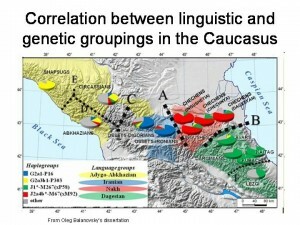 Another reason I am surprised at Balanovsky’s critique of Longobardi et al.’s conclusion that genes correlate more closely with language than with geography is that the same language/gene correlation has been found in Balanovsky et al.’s 2011 study of the Caucasus region (discussed briefly in my earlier post). 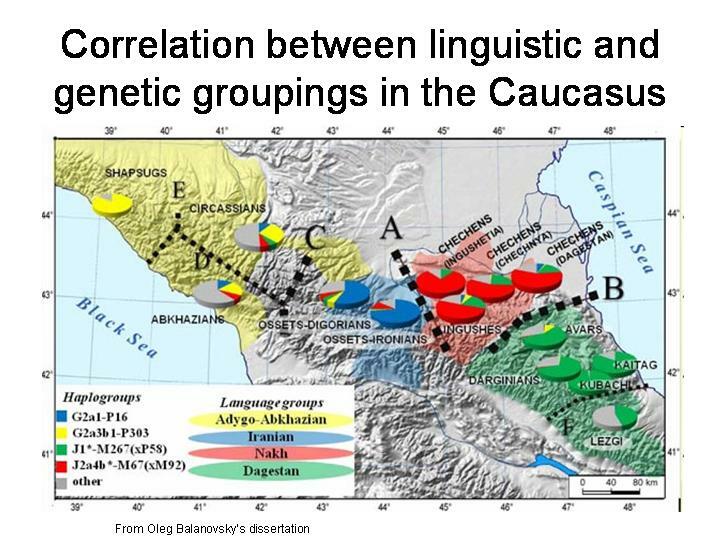 As can be seen from the image, reproduced on the left from Oleg Balanovsky’s doctoral dissertation, each distinct language family in North Caucasus—Adygo‑Abkhazian, Ossetian, Nakh, and Dagestanian—correlates with a particular predominant Y‑haplogroup. 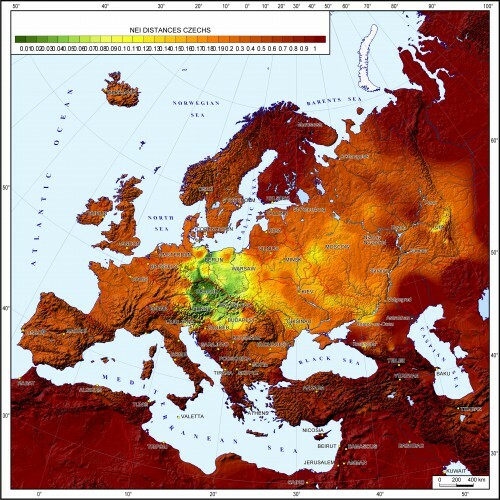 While Balanovsky mentions the conclusion of his Caucasus study in his critique of Longobardi et al., he suggests that Europe is different from the Caucasus in that in Europe the geography rather than language is expected to correlate more closely with genetics. It is not clear to me, however, why that should necessarily be so. The only group in Europe that is distinctive linguistically but not genetically is the Hungarians: their language belongs to the Finno-Ugric rather than Indo-European family, but their genetic profile is very similar to those of their neighbors. For example, according to Novembre et al., Hungarians are genetically similar to (in descending order) Czechs, Slovenians, Croatians, and Austrians. 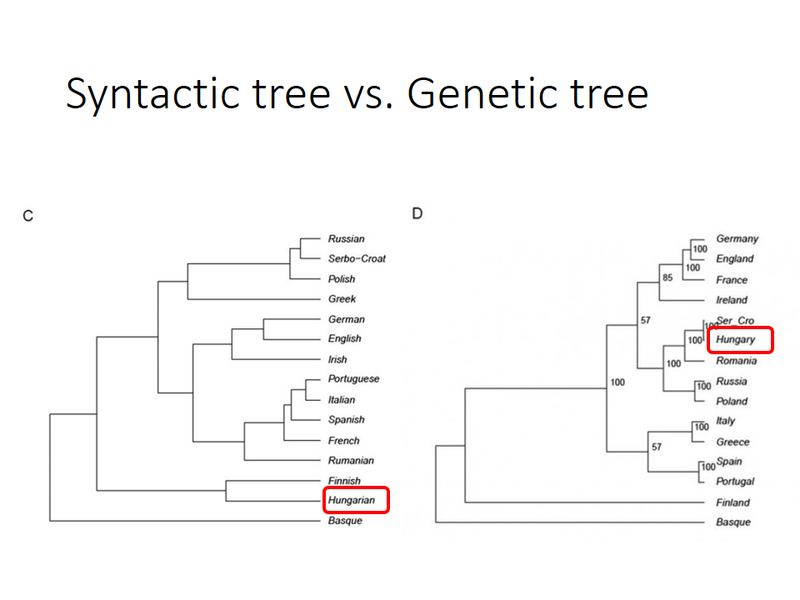 Yet, Longobardi et al.’s study includes Hungarian, and indeed their syntactic and genetic trees reflect the differing positions of Hungarian in those two domains: clustering with Finnish in the syntactic tree yet clustering with Serbo-Croat and Romanian populations on the genetic tree. 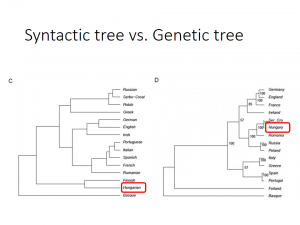 In fact, Hungarians are one striking exception to the overall pattern, yet apparently not sufficient to destroy the correlation between languages and genes. The other two European populations in Longobardi et al.’s study whose languages are distinctive are Finns and Basques, but as most genetic studies show, these populations are also genetically distinctive. In conclusion, I’d like to point out a fascinating connection between the findings of Longobardi et al.’s study with intriguing ideas proposed by Baker (2001, 2003). If, as Longobardi et al. claim, linguistic diversity correlates closely with genetic diversity among humans, the next obvious question is why. Baker conjectures that differences in language, including parametric differences (i.e. different values of syntactic parameters), are an overt and easily identifiable marker of genetic differences. After all, people typically acquire their mother tongue from those whom they are genetically related to. As a result, people tend to speak the language of “our people”, and such a distinction between “us” and “them” typically determines who one fights with, who one marries, and who one shares information with (hence, Baker’s notion of “language as a cipher”). Thus, although Longobardi and Baker work with different notions of what syntactic parameters are and how many of them there are (for a detailed discussion, see Pereltsvaig 2015), Longobardi’s computational results and Baker’s thought experiments find surprising harmony. Baker, M. (2001) The Atoms of Language. Basic Books. Baker, M. (2003) Linguistic differences and language design. TRENDS in Cognitive Sciences 7(8): 349-353. Balanovsky, O; K Dibirova; A Dybo; O Mudrak; S Frolova; E Pocheshkhova; M Haber; D Platt; T Schurr; W Haak; M Kuznetsova; M Radzhabov; O Balaganskaya; A Romanov; T Zakharova; D F Soria Hernanz; P Zalloua; S Koshel; M Ruhlen; C Renfrew; R S Wells; C Tyler-Smith; E Balanovska; and The Genographic Consortium (2011) Parallel Evolution of Genes and Languages in the Caucasus Region. Molecular Biology and Evolution 28(10): 2905–2920. Longobardi, G.; et al. (2015) Across Language Families: Genome Diversity Mirrors Linguistic Variation Within Europe. American Journal of Physical Anthropology. Nasidze, I.; et al. (2007) The Gagauz, a Linguistic Enclave, are not a Genetic Isolate. Annals of Human Genetics 71(3): 379–389. 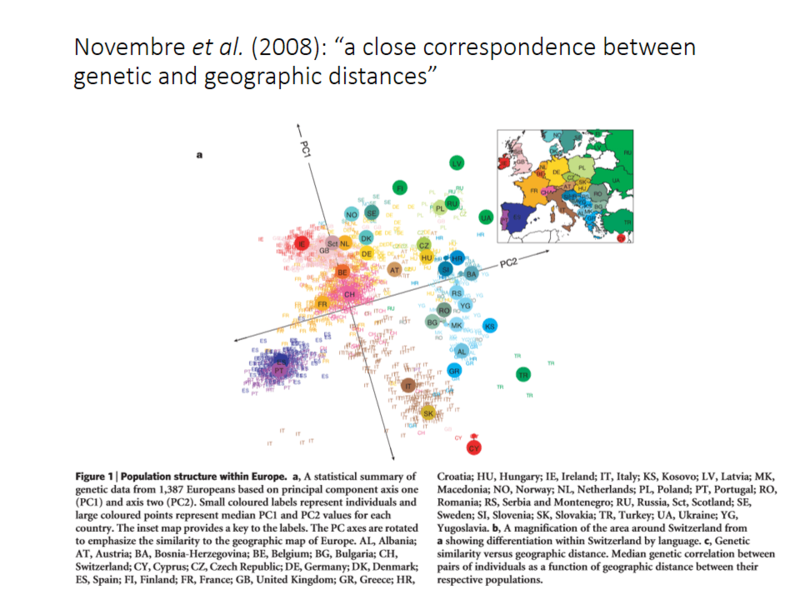 Novembre, J., Johnson, T., Bryc, K., Kutalik, Z., Boyko, A. R., Auton, A., … & Bustamante, C. D. (2008) Genes mirror geography within Europe. Nature 456(7218): 98-101. Pereltsvaig, Asya (2015) The Functional Structure of the Nominal Domain. In: Antonio Fábregas, Mike Putnam & Jaume Mateu (eds.) Contemporary Linguistic Parameters. London: Bloomsbury. Pp. 303-331. Varzari, A.; et al. (2009) Searching for the Origin of Gagauzes: Inferences from Y-Chromosome Analysis. American Journal of Human Biology 21(3): 326–336.